Please note Alpha, Will happily give tuition in a clients own vehicle if a dual instructor brake is fitted. Where a dual brake is not fitted then a risk assessment will be carried out, without a DUAL brake the Driving instructor has little or no control over the vehicle. ALPHA's tuition vehicle can cover about 95% of clients with specific physical driving and mobility needs, but there will be a few clients who either, cannot transfer into my vehicle or they require adaptation which are very complex, this is when we look into tuition in the clients own vehicle. I have experience in teaching in these vehicle and have taken specialist training, CPD in driving and teaching in DfW WAV's with complex Hi-Tech controls. e.g. 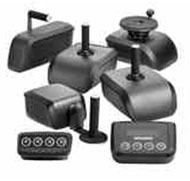 Electronic Gas & Brake (EGB), 2way & 4way joysticks, Mini-steer, Paravan Space-Drive & Joy-Steer systems. 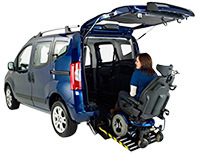 Most client needing tuition in a Drive from Wheelchair WAV will be sourcing their vehicle through the Motability scheme. Motability understand the need for Familiarisation training in a DfW WAV especially when the client has never driven with these complex adaptations. Where Familiarisation or Learner driver training is through Motability, then Motability will usually fit a dual brake for the instructor to ensure the safety of the client, instructor & public, afterwards, Motability usually arrange for this to be removed. Please note Alpha Will happily give tuition in a clients own vehicle if a dual brake is fitted. Where a dual brake is not fitted then a risk assessment will be carried out, without a DUAL brake the instructor has little or no control over the vehicle. With complex DfW WAV it is recommended that the instructor is present at the vehicle handover, this allows you and your instructor to familiarise yourselves with the vehicle and have the conversion representative on hand to give you information about the conversion of the vehicle if needed. 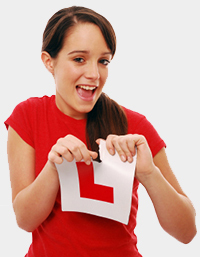 You will also need to ENSURE that your instructor is named on the vehicle insurance. Should any need arise, e.g. where they need to drive you to or from suitable training area, or if you were to become unwell or overwhelmed during tuition. 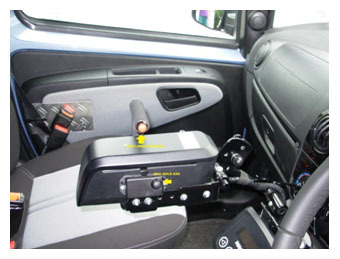 Hi-Tech Space Drive systems, It allows persons with low residual strength, minimum movement capabilities and even those without limbs to safely drive a car. With Space Drive, you activate the brake, accelerator, and steering wheel (and of course all the other functions) using driving aids controlled by microprocessors. These transmit the signals in nanoseconds to servo motors for the brake and accelerator and for others for the steering ("Drive by Wire"). configured the modules individually. The software and hardware Can be readjust if your clinical picture changes. All primary functions such as braking, accelerating and steering can be executed safely and conveniently using the acceleration/brake lever, joystick, bicycle-type steering and mini-steering wheel. Possible Funding: Haydn of Alpha Automatic is registered with Motability for MMAP & Motability Learner Driver Scholarship. If they try to put you through to Motability Grants say very clearly that the adaptations are provided by Motability Operation. Ask for funding for 6 if after those 6 hours you don't feel ready you can ask for further funding this will need to be supported with a report from the instructor. • State that the adaptations have been funded by MMAP and are being used for the first time; tuition is needed to ensure that you can use them safely. Ask for written confirmation of their agreement to fund the tuition and detail how to claim back the cost of the tuition. If you are an existing Motability customer, additional charitable support may be available for up to 40 hours of tuition. To qualify for help you must be a current customer of the Scheme and hold a valid provisional license. If funding is granted you will need to complete your tuition within 12 months. In receipt of DLA Disability Living Allowance high rate mobility component or PIP Personal Independent Payment enhanced rate. Non Motability customers who are either in full time education or in receipt of benefits. Motability could fund 40 hours tuition. The ADI is paid by BSM/Motability (usually the client does not pay the ADI except in exceptional cases). Motability does not pay DVSA test fees, theory or practical, that is the pupil's responsibility. BSM have the contract for undertaking tuition for Motability Young Drivers Scheme. If BSM does not cover the area for tuition Motability may consider referring the tuition to an independent ADI. If BSM do not have a suitable tuition car or do not have the required adaptations available again Motability may consider referring the tuition elsewhere (possibly to a mobility centre who have access to more specialised adaptations). BSM would normally be required to undertake a 2 hour assessment lesson to ascertain the suitability of their vehicle/adaptations before any decision to outsource tuition to an independent ADI is made. Motability/BSM would normally authorise a 2 hour assessment lesson and then, Motability/BSM would then authorise a further 12 hours tuition, (since May 2015), Motability require ID forms completed and returned & the theory test date is booked you will need a DVSA booking reference to advised to BSM/Motability section. 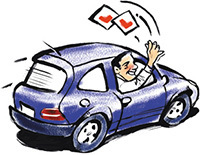 (It is advisable to contact the theory test booking service in good time, if you have specific requirements.) The final 26 hours tuition would only be authorised when the theory test has been passed. Please contact BSM/Motability Customer Services Team on 0800 316 3742 for more information on applying for help. Please note Motability are unable to provide funding for post test driver training or practical & theory tests fees. Welcome, to my site I hope you find the information in the pages helpful and informative. Whether or not you have a disability, if you are looking for automatic driving lessons in Shrewsbury or surrounding area please take a look around and see what I have to offer. 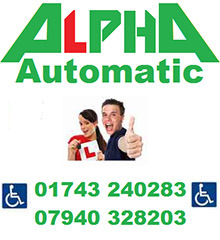 ALPHA Automatic is the only driving school in Shropshire, to exclusively, teach in an automatic vehicle, using specialist adaptations, to enable clients with specific needs to learn or return to driving. I am committed to providing client centred coaching for people with specific needs, focusing on a clients abilities NOT disabilities. I'm a DVSA Approved Driving Instructor with 25 years experience, I specialise in clients with Disability, Specific Educational & Emotional Needs, and I'm trained to Advanced level in mobility & educational needs. I understand that everyone's situation is individual to them, so please feel free to contact me, and discuss your individual requirements. I can offer advice on Adaptations or Tuition, on a no obligation basis. No hard sell! The tuition vehicle, Vauxhall Meriva Automatic, 1.7cdti, the new shape with forward opening rear doors, which gives excellent access, with adaptations, including Hand Controls, Left Foot Gas Pedal and Wireless Secondary Controls. I am a Founder Member of the Association of Disability Driving Instructors, and a Member of Motor Schools Association, I'm currently on MSA Regional Committee, Disabled Motoring UK, Spinal Injuries Association and Shropshire Disability Network. I am also the former Chairman of Shropshire and Powys, RoSPA Advanced Drivers Association. I have an excellent reputation and often get referrals from other Approved Driving Instructors, Driving Examiners and Mobility Assessment Centres/Assessors.